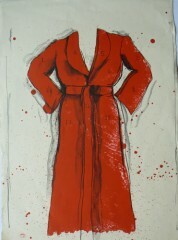 Jim Dine-Original lithographs -free shipping. 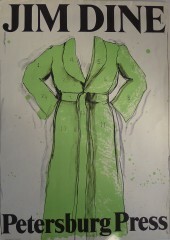 Jim Dine painter, print maker and poet, was born in 1935, in Cincinnati, Ohio. He studied at night at the Cincinnati Art Academy during his senior year of high school, continuing his studies at the University of Cincinnati and the School of the Museum of Fine Arts, Boston. He received his BFA in 1957 at Ohio University, Athens. Dine moved to New York in 1959 and soon became a pioneer creator of Happenings together with Allan Kaprow, Claes Oldenburg and Robert Whitman. He exhibited at the Judson Gallery, New York in 1958 and 1959, and had his first solo at the Reuben Gallery, New York, in 1960. In 1965 Dine was a guest lecturer at Yale University, New Haven, and artist-in-residence at Oberlin College, Oberlin, Ohio. He was a visiting artist at Cornell University, Ithaca, New York in 1967. From 1967 to 1971 he and his family lived in London. Dine has had several solo shows in museums in Europe and the United States. In 1970, the Whitney Museum of American Art, New York, organized a major retrospective of his work and in 1978 the Museum of Modern Art, New York presented a retrospective of his etchings. Dine lives in New York and Putney, Vermont. 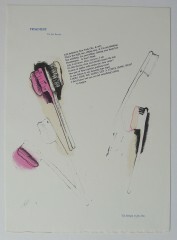 Dine has also made a number of three-dimensional works and environments, and is well-known for his drawings and prints. He has written and illustrated several books of poetry.